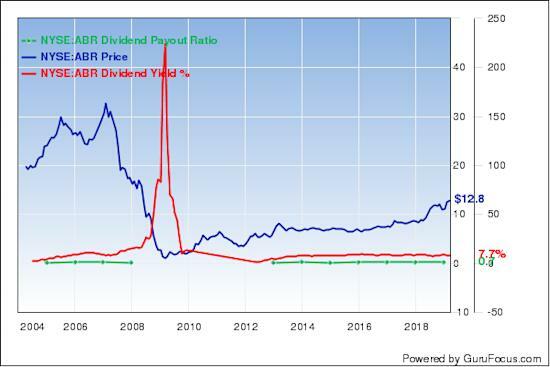 Arbor Realty Trust Inc.'s (ABR) dividend yield is 8.2% with a payout ratio of 65%. Over the last 52 weeks, the share price has risen 44%. The stock is trading with a price-book ratio of 1.59 and a price-earnings ratio of 8.49. Warning! GuruFocus has detected 5 Warning Signs with ABR. Click here to check it out. The real estate investment trust has a market cap of $1.1 billion and a profitability and growth rating of 4 out of 10. While the return on equity of 13.98% is outperforming the sector, the return on assets of 2.80% is underperforming 66% of companies in the Global REIT - Diversified industry. Its financial strength is rated 3 out of 10. The cash-debt ratio of 0.07 is above the industry median of 0.06. The company's largest guru shareholder is Jim Simons (Trades, Portfolio)' Renaissance Technologies with 0.18% of outstanding shares, followed by Paul Tudor Jones (Trades, Portfolio) with 0.13% and Steven Cohen (Trades, Portfolio) with 0.11%. 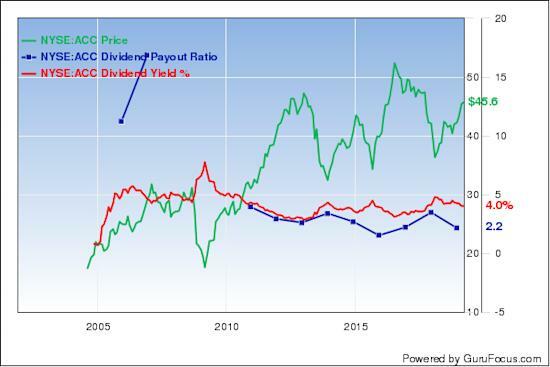 American Campus Communities Inc.'s (ACC) dividend yield is 3.95% with a payout ratio of 217%. Over the last 52 weeks, the share price has risen 21%. The stock is trading with a price-book ratio of 1.80 and a price-earnings ratio of 55.11. With a $6.27 billion market cap, the REIT has a profitability and growth rating of 5 out of 10. The return on equity of 3.30% and return on assets of 1.68% are underperforming the sector and are ranked lower than 80% of competitors. Its financial strength is rated 4 out of 10. The cash-debt ratio of 0.02 is underperforming 70% of industry peers. The equity-asset ratio of 0.50 is slightly below the industry median of 0.52. Diamond Hill Capital (Trades, Portfolio) is the company's largest guru shareholder with 1.49% of outstanding shares, followed by Simons' firm with 0.36% and Chris Davis (Trades, Portfolio) with 0.25%. 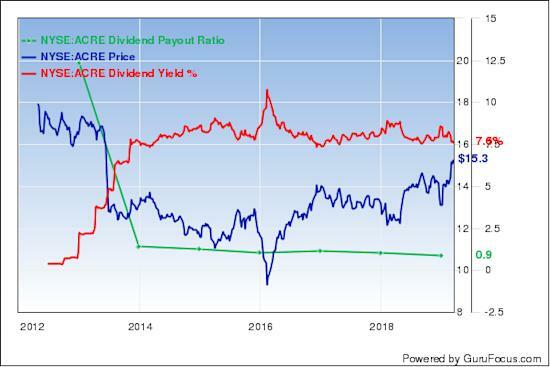 Ares Commercial Real Estate Corp.'s (ACRE) dividend yield is 7.59% with a payout ratio of 86%. Over the last 52 weeks, the share price has risen 20%. The stock is trading with a price-book ratio of 1.03 and a price-earnings ratio of 11.22. The company, which provides real estate loans and related investments, has a market cap of $438.8 million. GuruFocus rated the company's profitability and growth 8 out of 10. While the return on equity of 9.14% is outperforming the sector, the return on assets of 2.23% is underperforming the sector and is ranked lower than 70% of competitors. Its financial strength is rated 3 out of 10. The cash-debt ratio of 0.01 is underperforming 99.99% of competitors. The equity-asset ratio of 3.05 is above the industry median of 0.81. With 1.04% of outstanding shares, Hotchkis & Wiley is the company's largest guru shareholder, followed by Simons' firm with 0.95% and Scott Black (Trades, Portfolio) with 0.56%. 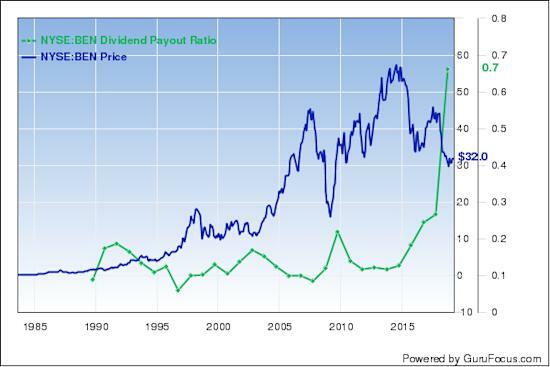 Franklin Resources Inc.'s (BEN) dividend yield is 2.97% and the payout ratio of 32%. Over the last 52 weeks, the share price has fallen 20%. The stock is trading with a price-book ratio of 1.67 and a forward price-earnings ratio of 13.64. The investment management company has a market cap of $16.28 billion. GuruFocus rated its profitability and growth 6 out of 10. The return on equity of 15.61% and return on assets of 10.20% are outperforming the sector and are ranked higher than 83% of competitors. Its financial strength is rated 8 out of 10. The cash-debt ratio of 9.12 is below the industry median of 480. David Carlson (Trades, Portfolio) is the company's largest guru shareholder with 1.97% of outstanding shares, followed by Richard Pzena (Trades, Portfolio) with 1.84% and the T Rowe Price Equity Income Fund (Trades, Portfolio) with 1.09%. 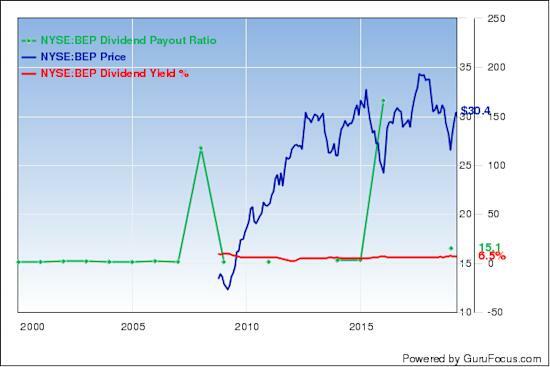 Brookfield Renewable Partners LP's (BEP) dividend yield is 6.44% with a very high payout ratio of 1,508%. Over the last 52 weeks, the price was stable. The stock is trading with a price-book ratio of 1.84 and a price-earnings ratio of 229.24. The renewable power-generating company has a market cap of $9.47 billion. The company has a profitability and growth rating of 9 out of 10. The return on equity of 0.56% and return on assets of 0.20% are underperforming the sector and are ranked lower than 74% of competitors. Its financial strength is rated 4 out of 10 with a cash-debt ratio of 0.02 that is underperforming 70% of competitors. With 0.09% of outstanding shares, Simons' firm is the company's largest guru shareholder. 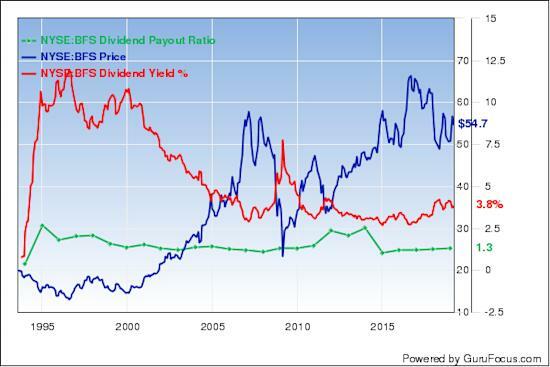 Saul Centers Inc.'s (BFS) dividend yield is 4.07% with a payout ratio of 130%. Over the last 52 weeks, the price was stable. The stock is trading with a price-book ratio of 6.56 and a price-earnings ratio of 32.19. The company, which operates and develops retail and commercial properties, has a market cap of $1.14 billion. GuruFocus rated its profitability and growth 6 out of 10. While the return on equity of 10.52% is outperforming the sector, the return on assets of 3.45% is underperforming the sector and is ranked lower than 54% of competitors. Its financial strength is rated 4 out of 10. The cash-debt ratio of 0.01 is below the industry median of 0.06. Simons' firm is the company's largest guru shareholder with 1.86% of outstanding shares, followed by Pioneer Investments (Trades, Portfolio) with 0.02%.